Millennial Parents’ Guide to Financial Planning For Children! When did doing the best for our children get so expensive? As if sleep deprivation, physical exhaustion, brain fog, and loss of personal identity wasn’t already enough to cope with, parents have another battle to confront: avoiding the temptations of 21st-century consumption. Our social media feeds are bursting with photos of perfectly decorated nurseries, babies sporting designer clothing, and promenades in the park sporting luxury strollers with a subtext this is the best thing for your baby. I remember making my first trip into a giant baby-themed box store during my early days of pregnancy and feeling overwhelmed by the infinite choices of cribs, car seats, high chairs, strollers and playpens. Not to mention the $300 baby bassinet I’ll use for three to six months, or the variety of swing seats, bouncers and over-stimulating baby toys. I couldn’t help asking myself: does my baby need a $900 stroller? Will it really help me plan and prepare for my child’s future? As I walked through the aisles of adorable clothing for every occasion, I imagined my unborn daughter – who at the time was merely the size of a cantaloupe – having a more luxurious wardrobe than I’ve ever had, despite the fact that she’ll outgrow most of the outfits within a month or two. And yet the greatest pressure, which weighed on my shoulders in a way I never expected, was what the purchases would say about me as a mother. If my husband and I didn’t buy her all that gear and opted for lower costing items instead of spending thousands on designer brands, were we depriving our child? Or were we deciding between being practical today in order to plan for her future? As a new parent, I want to give my daughter everything she will need to succeed in life. 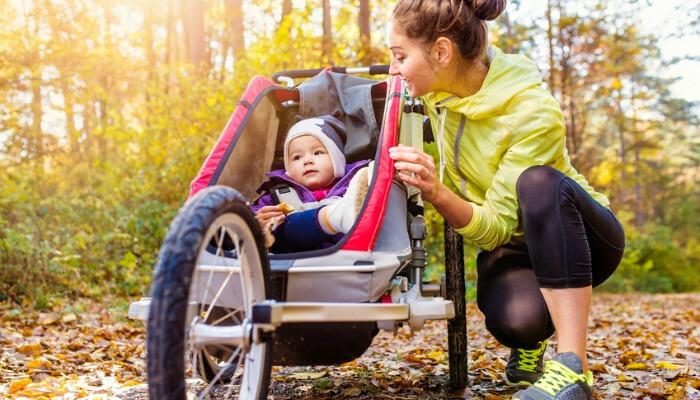 How is a $900 stroller planning for her future? The truth is, she won’t know or remember what brand name decorated her outfits, or how many toys she had to play with. If I really want to plan for my child’s future, I need to let go of the guilt around purchases missed and do what’s best for my child’s future. What if instead of succumbing to the marketing hype around today’s young parent must-haves, I chose to focus on planning for her tomorrow? Like my parents’ dreams for me, I have the same dreams for her except now the rising cost of tuition will mean my child’s options may be limited. The sky high down payment she’ll need in order to put down roots in her own home one day may be out of reach. What if her dream is to travel the globe, or open her own business or travel around the world? The reality is, the greatest gift I can give my daughter is to plan and invest for her future as soon as she’s born rather than simply whip out the credit card today. I decided that I will invest $7 a day for my child’s future. Suddenly, the spending decisions don’t feel so daunting. I decided to change my two cups of latte every day into a plan for her future. Now I just make my coffee at home before taking her to the park in the stroller I bought online from a cute baby retailer that had a huge sale. Believe it or not, that two lattes a day enables me to save for her future from the day she turns two weeks old. A friend of mine who had a son six months ago told me about Child Plan™, a participating whole life plan. I was surprised to know that with my little $7 a day she would have an investment worth $69,465 by the time she’s 21 and that will continue to grow throughout her whole life. I was happy to learn how flexible this plan was and it had absolutely no restrictions what path she chooses in life and that it will provide her with the security to cover any financial need in life – like pursuing her post-secondary degree anywhere in the world, buying her own home, launching her own business or for whatever dream she has. Suddenly, walking through the aisles bursting with adorable nursery décor and smart baby gadgets without picking up a single thing wasn’t so tough. The only sacrifice I made for her future was two cups of latte per day because as her mom I have to make sacrifices for her future because I really want what’s best for my kids. As it turns out I can still buy the $900 stroller if I choose to and I can walk right past Starbucks because my baby is worth that and so much more.